High Quality Brand New HDMI V2.0 and 100% backwards compatible with HDMI V1.1, V1.2, V1.3 and V1.4. The connectors are made of solid metal and feature gold plated contacts to ensure optimal data transfer. An optimal signal transfer is the basis for brilliant HD picture quality, high end cable ensures this. A very robust nylon shielding gives the cable the necessary stability without restricting its flexibility. The integrated network function of the cable allows you to control your network compatible devices such as TV, HD recorder or Blue ray player without an additional LAN cable. Experience great entertainment in your home cinema evenings or immerse yourself in realistic 3D gaming worlds. 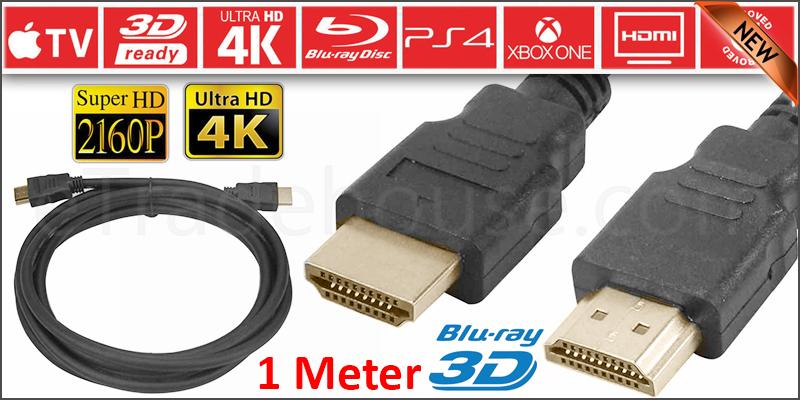 This high-end cable supports crystal clear multimedia applications and offers you a unique HD entertainment experience and excellent video and audio quality.